Field Supervisor of Trench PC 24, Ashley Bennett. As PC 24 was opened only five excavation days ago, we are just now beginning to get a feel for what this trench may have to offer us, and things are getting exciting. With the closing of PF 11, and our great move to the top of Poggio Colla at the site of the monumental building, we have all spent this first week adjusting to the differences between the two sites. 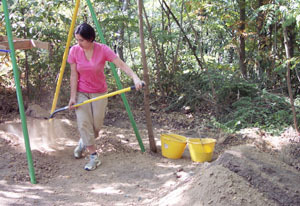 First off I would like to welcome Meg Common to our excavation team, and to mention the loss of Joe Cosentino to PF 9 in the FOD where he will finish the rest of the season. 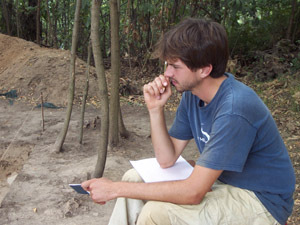 In addition to this, not only are the physical aspects of excavating each place very different; dealing with heat, plow zone, and rock hard dirt in the FOD, as opposed to the shade, tree stumps and multiple strata that we are now facing, but the two contexts are dramatically different. 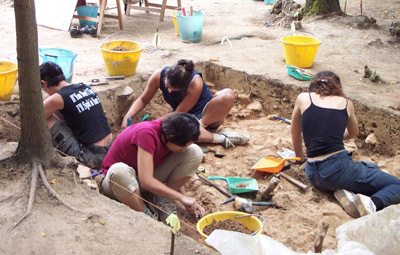 We have gone from excavating what we thought to be the exterior space of a ceramic production site and possible habitation, to excavating what may be the exterior space of a known monumental building with three distinct building phases. 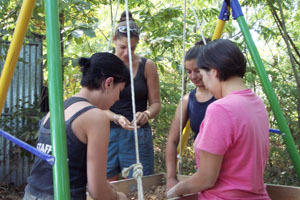 Left to right: Meg Common, Ashley Bennett, Andrea Mall, and Jessica Leger sifting. As the foundation walls of the building on Poggio Colla are further excavated with each season, the purpose of PC 24 is to explore the south side of this building. In previous years, PC 1 revealed a Phase III south wall running parallel to the primary south foundation wall, also Phase III. This raised many questions as to the function of this second wall that have yet to be answered. In addition, last season Justin Winkler, in PC 22, found that his south wall of the monumental building made a strange curve to the north and seemingly connected to a sort of wall spur running in a southerly direction from it in his extreme south-west corner. These two facts were the primary reasons for the placement and excavation of PC 24. Located directly south of PC 17, our 5m x 5m trench hopefully will help us to discern the function of this second south wall, and the space within it. The most probable theories are that it was either a terracing wall associated with the third phase of the monumental building, or that possibly we have another structure entirely, of which the second wall found in PC 1 is actually the north foundation wall. View of Trench PC 24 from the south during Week 4. View of Trench PC 24 from the north during Week 4. So, with all of these questions to answer, we have already begun to peel back our second stratum in PC 24. 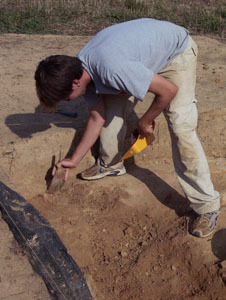 With time working against us, we are currently excavating only Loci 1 and 4. Our first stratum being humus, it is within this second stratum that we should begin to see the tops of any walls if they exist in this location. It is also where we are starting to see evidence of burnt ceramics, eroded roof tiles, and even some small pieces of amorphous metal slag. from scarp between two tree stumps. These first few days, however, have been spent battling the numerous roots that weave their way through the top levels of this stratum, as well as dealing with the delicate issue of extracting two gigantic tree stumps, one of which was sitting precariously in our west scarp. I must give full credit to my assistant, Kirk Nickel, for working nearly eight hours straight to accomplish this feat. Bravo! Yet again patience is proving to be a great virtue, and judging by the increasing number of artifacts and suggestive stones at the bottom of this pass, it will surely pay off. 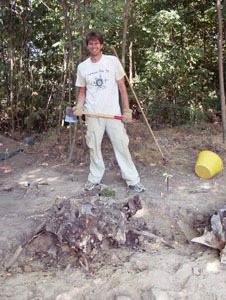 Above and below: Kirk "The Lumberjack" Nickel at work on a PC 24 stump. 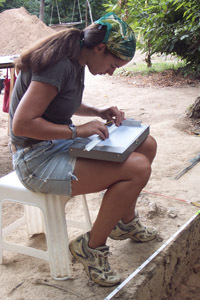 Jessica Leger shovels dirt from the sifter to the pile for PC 24.
drawings of finds, trench plans, and thorough notes. Ashley Bennett's extraordinary scarp maintenance skills. Ashley Bennett and Estelle Reddeck. As Thursday comes to a close, we are all still drying out from the torrential downpour that greeted us on site Monday morning. Both students and the trenches alike were soaked through and through, and it has taken all week for everything to dry out. Due to this unfortunate weather, excavation moved very slowly and ceased early several days this week. PC 24, however, was very lucky, in that the rain did not greatly affect the actual trench, meaning stratigraphy and scarps were left unharmed. Other trenches were not as lucky. deal with the tree stumps, roots, and rain in Trench PC 24. Once we did get moving again on Wednesday, we finished our pass through Level 1 of our Stratum 2, and got started on the next pass through Level 2 of Stratum 2. While the first pass yielded only minimal burnt ceramic sherds, along with some tile inclusions and a few sparse black glaze pieces, we did uncover the top of some large stones. Those became our main focus, and as we continue this second pass we have found that these blocks do indeed sit on top of others. While nothing is definite as of yet, this certainly indicates great potential for a wall structure. Additionally, while keeping our eyes out for a stratum change, I noticed that the soil in our northeast corner seemed to have a much more red appearance and was yielding a great deal of large coarseware and tile fragments. If we do find a wall, this could be evidence of wall packing, but at this point our elevation is still too high to tell. The completion of this pass, and the beginning of the next will help to answer some of these questions. Kat Hinds, Jessica Leger, Kirk Nickel, Meg Common, and Andrea Mall. View from the west of Trench PC 24 opened at the beginning of Week 4. Left: Jessica Leger maintaning scarp in PC 24. 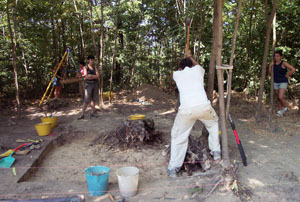 Right: Andrea Mall excavating in PC 24. Cat Hinds, Andrea Mall, Jessica Leger, and Ashley Bennett. Stay tuned for the entire cast, which includes Kirk Nickel, shown below. while the rest of the crew continues work in PC 24 on the arx of Poggio Colla. 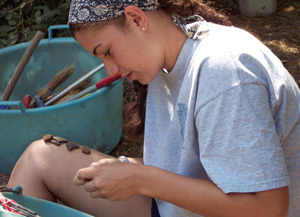 I can hardly believe it, but sadly it is true that our excavation season is coming to a close. This is especially disheartening to those of us in PC 24 because our trench was begun much later than the others, after we excavated PF 11. 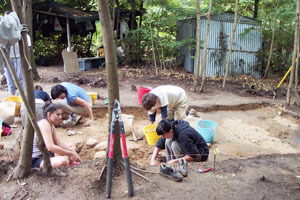 However, despite the shorter excavation period, I still feel like we have accomplished a lot and answered many questions. At the current moment we are working on our first pass through Stratum 3, in one of our Loci, Locus 1. Stratum 3 is our first real archeological level and corresponds with the Phase 3 building construction. I have chosen to limit excavation to this area because I feel that this will get us to a good stopping point by the end of the season. What we have found already in Stratum 3 has insured that this trench will be reopened next year. We have ascertained that there is a wall structure running north-south along our west scarp, and we are currently excavating what appears to be a type of floor or terrace packing within Stratum 3. This is made even more exciting, as there are portions of large coarseware vessels within this packing. If we are lucky, we may have at least a full profile to reconstruct. With three more excavation days left, I plan on finishing out one more pass within Stratum 3. While there is still much work to be done here, it gives us something to look forward to for next year. 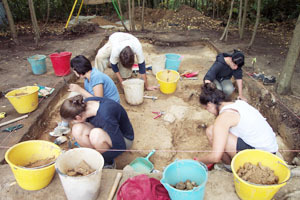 Clockwise from left: Meg Common, Andrea Mall, Chiara Gori, and Jessica Leger digging in PC 24. Meg Common separates finds from grotty bits in Trench PC 24. British volunteer Cat Hinds (foreground) returns for her second year. 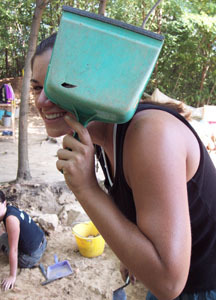 Volunteer Chiara Gori excavating in Trench PC 24. Meg Common, Cat Hinds, Kirk Nickel, Ashley Bennett. As the season is officially at an end and the backfill is in the trench, it is time for us to sit back and reflect on what we have learned from PC 24, and what new questions it has created. At the closing of excavation for the year we had successfully finished our first pass through Stratum 3, our first contextual level. It was within this pass that we were able to define what appears to be a N-S foundation wall, a portion of which is visible along our west scarp. I believe the rest of the wall sits to the west of PC 24. There are several interesting features of this construction that are worth mentioning. The first is the large rectangular stone in the extreme north corner, which may be the same stone we see in PC 22, extending from the Phase III E-W wall, to the south. 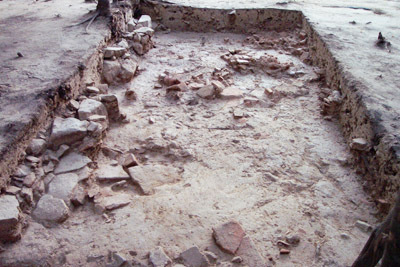 Further excavation is required to prove this, but that would make the two walls contemporary. 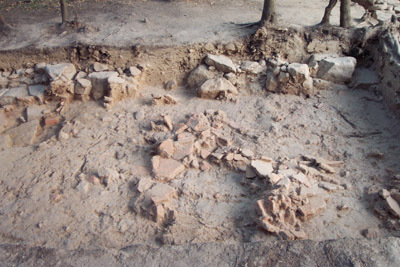 The rubble packing construction technique already appears to be Phase III. 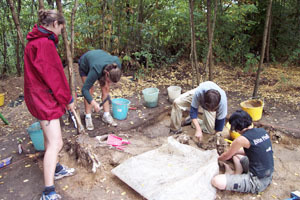 Trench PC 24 from the south at the end of the 2002 season. The second point of interest is the gap in the stones near the midpoint of our two loci. There is a distance of approximately 50.0cm where there is no visible foundation stone. It is possible that it merely exists at a lower elevation; however, there is no evidence of this. Additionally, I believe several of the stones immediately to the south of this gap are floating and have simply decayed into a sandstone block making them appear to be in situ. If they are indeed floating, and were removed, this would widen the gap to a distance of 70.0cm. This is a substantial distance and could be accounted for if a stone was robbed-out for re-use in a later construction. However, we know of no later phase than the one we believe this wall to be part of, Phase III. Another explanation may be that this was a threshold into an interior space to the west. 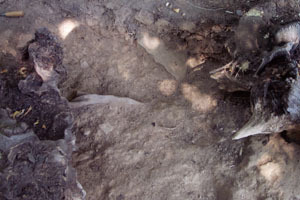 A slight change in stratigraphy was noted in this area, as there were several chunks of grey clay-like soil, as well as a general darkening of the soil near this gap. This is often evidence of a highly used area. Trench PC 24 from the north at the end of the 2002 season. The last interesting feature of the wall is the fact that it does not continue all the way to our south scarp. Again we may be dealing with a missing stone, a stone at a lower elevation, an unfinished construction, or potentially a corner. If there is a structure to the exterior of the main building, this foundation wall, as I believe it to be, could be the first evidence of it. Excavation to the west of PC 24 seems to be the next logical step and will help answer this question. More of the wall-like structure could be exposed, and stratigraphy could be analyzed on one side versus the other, looking for evidence of interior space as opposed to exterior space. View of Trench PC 24 from the east at the end of the 2002 field season. 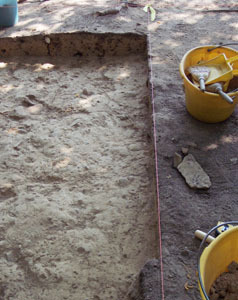 Aside from the wall-like structure, we have found an interesting stratum associated with it. 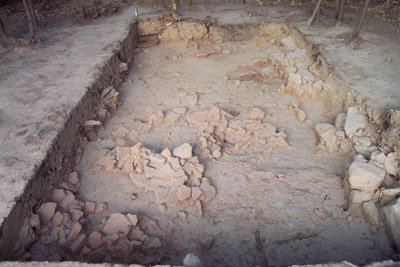 Stratum 3, which lies at approximately the same elevation, is full of many broken vessels, both fineware and coarseware, as well as many roof tile fragments, large and small. 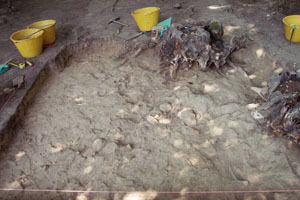 These areas of inclusion are oddly concentrated in certain areas of the trench while the rest of the trench has substantially fewer artifacts. I believe this to be a packing level, commonly associated with Phase III at Poggio Colla, which was created to fill and stabilize the area around walls, as well as to level the overlying floor. 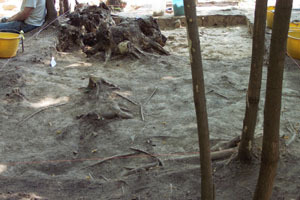 The same thing was found in PC 17 immediately to the north. Unfortunately, we have no evidence of a floor level here, as it would have eroded away quickly once the building fell into disuse. There is actually no evidence at this relatively shallow elevation to suggest that this is interior space. 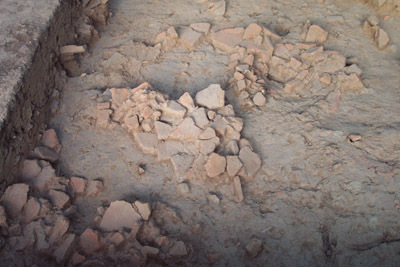 Detail of the tile fall in Trench PC 24. At this point in time I am very excited about the wall structure we have found, and I am anxious to continue excavation of this trench next season. Hopefully, we will find more clues as to the relationship of this area to the monumental building, as well as the function of our wall structure. There is a lot to think about in the following months, enough to keep us all busy, I am sure. Andrea Mall and Kirk Nickel lifting roof tile from Trench PC 24. 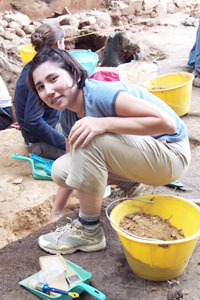 Jessica Leger with a new find from Trench PC 24. 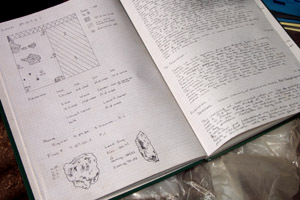 Ashley Bennett draws final plans of PC 24 for her field notebook. Assistant Field Supervisor Kirk Nickel draws scarp for the PC 24 field notebook. Backfill completed in Trench PC 24 (foreground) and underway in Trenches PC 19, 22, and 23. Jessica Leger, Ashley Bennett, and Cat Hinds.